This coach just ruined his career and future of others around him, when he allowed his players to dish out punishment over perceived disloyalty. According to police, at least one coach can be seen on a Snapchat video watching a junior varsity football player getting beat down in a Camden County High locker room, for sitting on the wrong side of a stadium the Friday before. 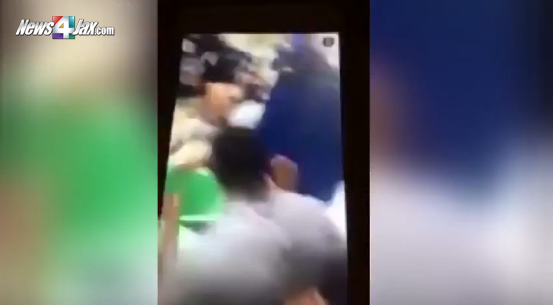 The video, which allegedly shows members of the Camden County High School football team beating a teammate, was sent to News4Jax by a concerned parent, who said it was recorded in the high school’s locker room on Labor Day. According to the police report, the JV player, whose name was not released, said he was at football practice Monday and was assaulted by several teammates in the presence of at least three coaches. A video posted to Snapchat shows the JV player being hit and kicked by teammates, who then throw him into a trash can head first and roll him down the hallway in the Camden County High locker room, according to the report. The beating happened about noon Monday after practice, and the student ended up at Southeast Georgia Health Systems Camden Campus in St. Mary’s, Georgia, where he reported the assault to police. The player told police that three coaches were present during the assault, and one of those coaches kicked over the trash can so the player could get out after he was rolled down the hallway. At least one of the three coaches can be seen in the video watching the altercation, police said. "The GBI will take part in a fact finding search for the truth to uncover any criminal violations that may have occurred during the incident,” GBI spokesman Scott Dutton said in an emailed statement.